Looking good mum, keep the good work. I wanted to say what a fantasic site this is,and I\'m quite pleased I found it. 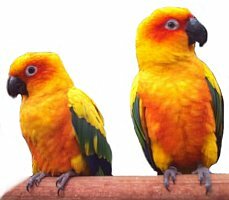 I\'m looking for a Blue Fronted Amazon male, a Sun conure female and a blue/yellow ringneck female. Would perhaps know of any going for sale? And lastly I\'m needing a bird hammock for my Sun Conure. Thank you so much! Thank you ever so for you blog article. Really thank you! Really Cool. What i find tough is to find a blog that can capture me for a minute but your blog is different. Bravo. Actually like your websites details! Undoubtedly an exquisite offer of knowledge that's extraordinarily helpful. Keep it up to hold publishing and i’m gonna proceed studying by the use of! Cheers. I've to confess that i generally get bored to learn the entire thing however i feel you possibly can add some value. Bravo ! After research just a few of the weblog posts in your web site now, and I really like your method of blogging. I bookmarked it to my bookmark website record and can be checking again soon. Pls take a look at my website online as properly and let me know what you think. Very Nice, I also like that one can change the currency. I real pleased to find this website on bing, just what I was looking for : D also saved to bookmarks .